Gary Cully [7(4)-0] was not happy when it looked likely that Karl Kelly would rematch Martin Quinn for the BUI Celtic lightweight title and the top prospect is even less impressed today. This morning it was announced that Kelly [2(0)-2(0)] would face Tyrone’s Feargal McCrory [9(3)-0] for the vacant Irish title on the big Ulster Hall bill in Belfast on Saturday February 9th. The news has not been greeted well by Kildare’s Cully who is keen to have domestic fights to definitively prove he is Ireland’s best lightweight. Earlier this year Cully claimed that six Irish opponents had turned down a fight with him – with Victor Rabei (injured at the time), Paul Hyland Jr (returning from a British title loss), Niall O’Connor (weight below), and Aiden Metcalfe (weight below) being named. Kelly was later noted to have been another, while today’s post would suggest that McCrory is the final one of the six. Kelly’s manager, Jay Byrne, would respond to Cully, noting how the Monkstown slugger would have no problem facing him but pointed to an offer of €1,000 and a percentage of ticket sales as being far too low. 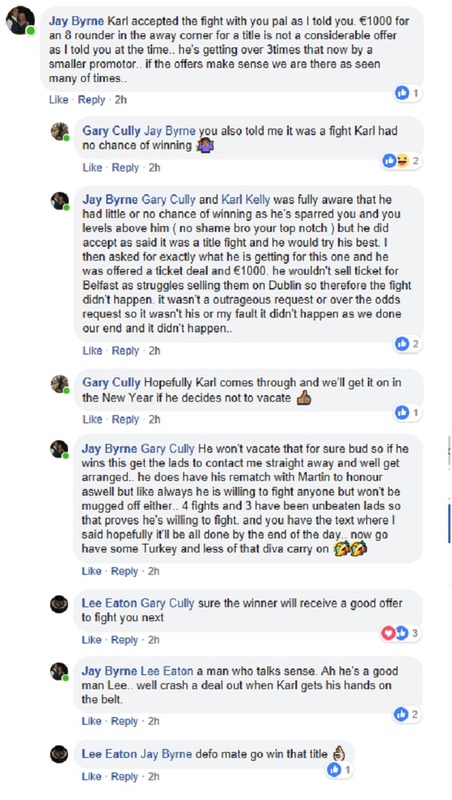 Lee Eaton, one of the promoters associated to Cully’s management outfit, would respond, promising an offer to the winner of the February 9th clash. The ‘A Night To Remember’ undercard bout was something of a surprising Christmas Week announcement, with Kelly having previously looked set to rematch Quinn following their controversial first fight last month while McCrory steps up in weight having been locked in negotiations with Irish super featherweight title mandatory Stephen McAfee. The increasingly impressive MHD bill is topped by James Tennyson and also features Paul Hyland Jr, Tommy McCarthy, Luke Wilton, Mathew Fitzsimons, and Cathy McAleer. Cully last fought at the start of this month where he destroyed Muhammad Kambuluta in the first round of his maiden eight-rounder. The Sarto southpaw is keen to progress extremely quickly and mentioned both IBF European titlist Robbie Barrett and WBC International Silver champion and Ray Moylette defeater Christian Uruzquieta as short-term targets.